Owing to the busy lifestyles, people are not able to take time out to care about their house and office exteriors. The result is, the exteriors including brick walls, driveways, pavements, tiles and concrete, etc. getting neglected. The outdoor elements and changing climatic conditions turn them muddy and stained and in due course of time they lose their original beauty and shine. Maintaining one’s property is the most vital activity which is required to be done from time to time. The apt way to maintain and take care of one’s property is to hire contractors who specialize in Wilmington pressure washing services. Our pressure cleaning is the professional and cost effective way of cleaning the property, garage maintenance and its exteriors with the high-speed water blast. 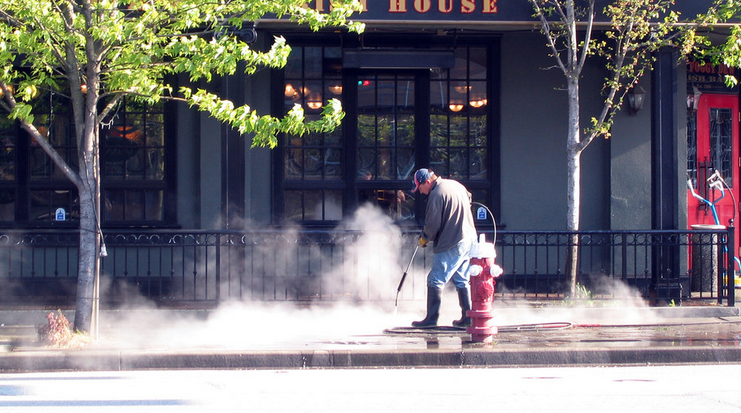 Hiring contractors offering the pressure cleaning services is very common today. They engage highly skilled technicians who are completely insured and have the right knowledge of the equipment, chemicals and methods used for pressure cleaning. Our pressure cleaning may involve just a water blast or usage of softening solutions and detergents before the high-speed water blast, all depending on the type of surface to be treated and its degree of untidiness. Major work of pressure cleaning involves cleaning the outdoors. Commercial window cleaning has many advantages. Firstly, the property gets retained to its original beauty and shine which helps in extending its life. Secondly, the exteriors and surroundings become much safer and hygienic and thirdly, the market value of the property improves by 5-10% which can be beneficial for the owner who is looking forward to selling his property.